At the Country Inn & Suites, High Point, you can enjoy a convenient location near Trinity, NC and money-saving amenities like free Wi-Fi. Swim laps in our hotel’s heated indoor pool after a busy day of sightseeing, or head to our fitness center for a workout. If you’re traveling for work, make our business center your temporary office with free high-speed Internet access, a computer, a printer and copy services. 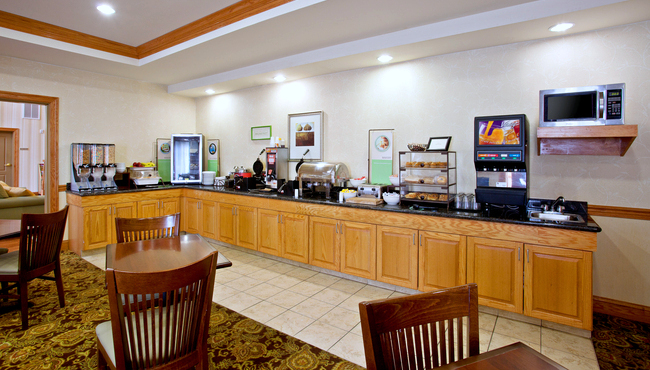 Before taking your kids to attractions like the Kersey Valley Zipline, fuel up at our free, hot breakfast. Fill your plate with eggs, Belgian waffles and Danishes, or munch on a muffin while you sip freshly brewed coffee. Lunch and dinner are also easy and delicious thanks to local restaurants like J. Butler’s Bar & Grille, Carolina’s Diner and Carter Brothers Barbecue Restaurant.